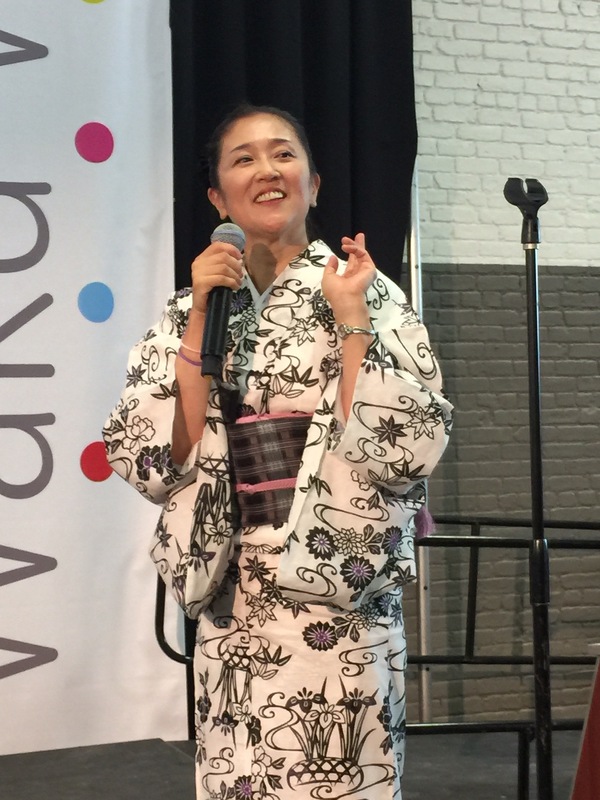 Waku Waku +NYC, in its first year, was a huge success among the thousands of attendees, albeit fans of anime/manga, J-Pop, video games or Japanese culture. 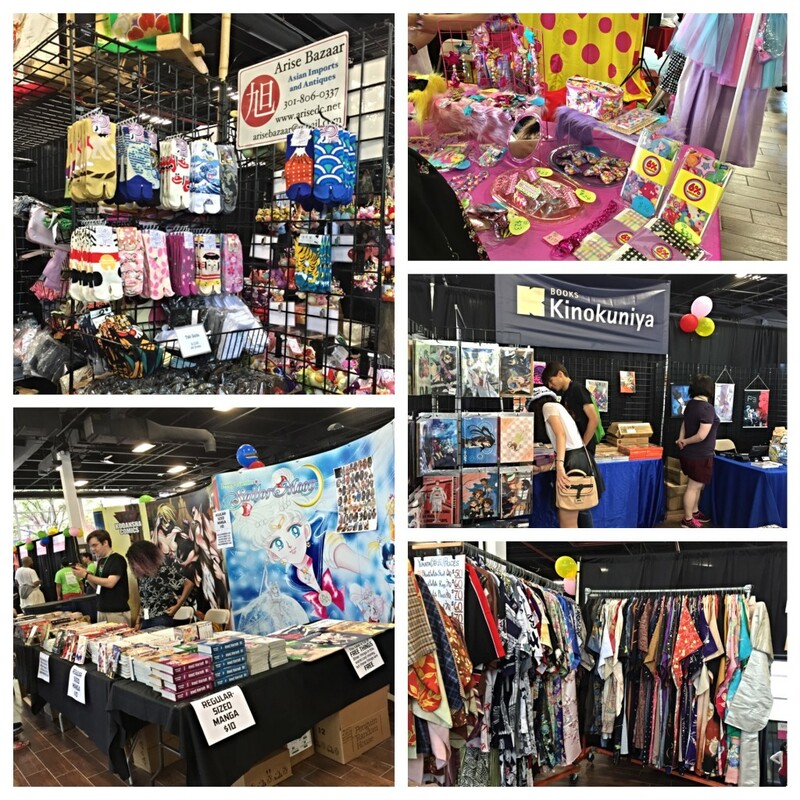 The impressive list of guests, vendors, panels and food stalls shows just how much the staff behind it all really loves Japanese pop culture and, being an avid fan of anime/manga myself, was amazed by the quality of this brand new convention! As most of you know, Waku Waku +NYC was in need of an official mascot, so they held a contest calling for fans to send in their artwork. The artist had no real regulations except that it had to resemble Waku Waku +NYC’s staff pup, Tucker, who made a special appearance on the con floor! 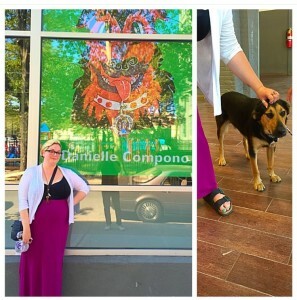 Left: Dannie Compono with her mascot entry as a window display and Right: Tucker, the Waku Waku +NYC staff pooch! Being an artist myself and a huge fan of this convention, I decided to contribute. 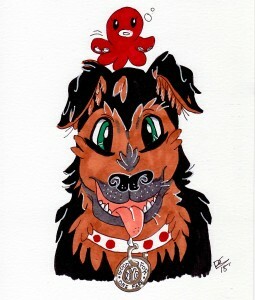 Using reference photos of Tucker, I tried my best to capture his cute, charismatic features and added a little tako (octopus) on its head, along with an infamous NYC token adorned around its neck, hanging from a Nihon pride printed collar. My entry was one of the finalists and was used as a window display at the convention. The winner and the other finalists can be seen here. The artwork of the winner and finalists were used to decorate all publications – such as the program schedule, volunteer/staff t-shirts, banners, window displays, and more. And a big congratulations to all the artists! I thought this contest was a nice touch and I was very fortunate to be able to contribute. 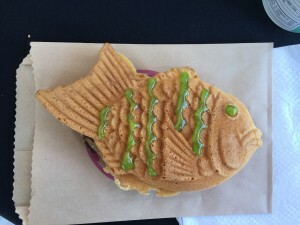 One of our first stops was Waku Waku +NYC’s very impressive ‘Savory Square’ which was located right outside the expo center where you can sample Japanese street foods and other cuisine. Popular establishments from NYC were present, such as Ippudo, BentOn, Beard Papa’s, Totto Ramen and much more! My favorite by far was the Otafuku x Medetai stall, where they sold freshly made taiyaki (fish-shaped pancake with red bean/custard inside) which you could then decorate yourself with an array of brightly colored frosting and sprinkles! As aforementioned, Waku Waku +NYC had many well-known names on its guest list, including video game creator Keiji Inafune (famous for the Megaman franchise) and artist Sebastian Masuda (known for his Hello Kitty time capsule installation in NYC). In addition, there were many interesting panels to attend. We tried our best to visit as many as we could! 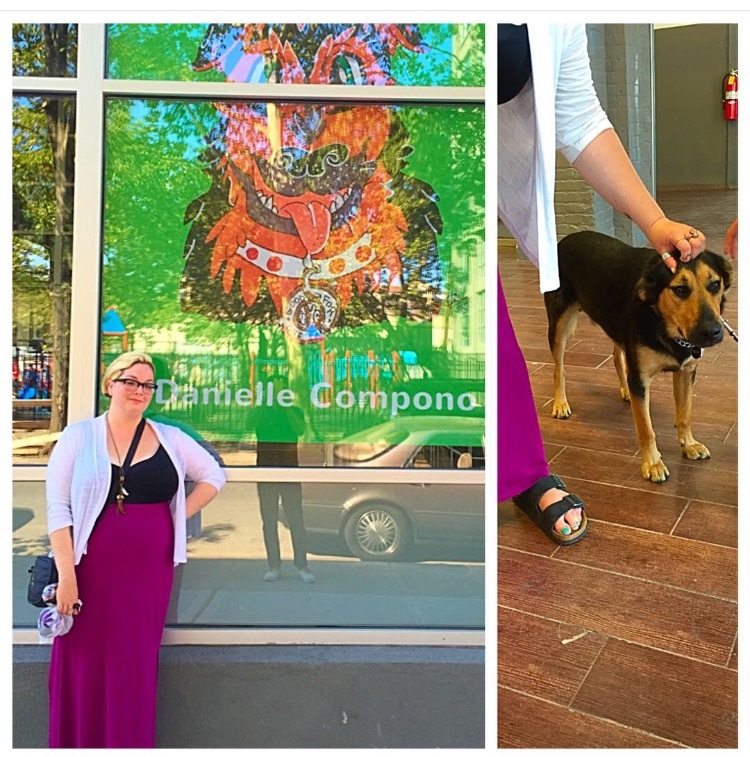 There were multiple venues close to the Brooklyn Expo Center, where the main convention was taking place; Transmitter Park, the Wythe Hotel, Verboten, and Brooklyn Bowl also hosted events. There was a convenient shuttle bus that transported con goers to and from the venues. 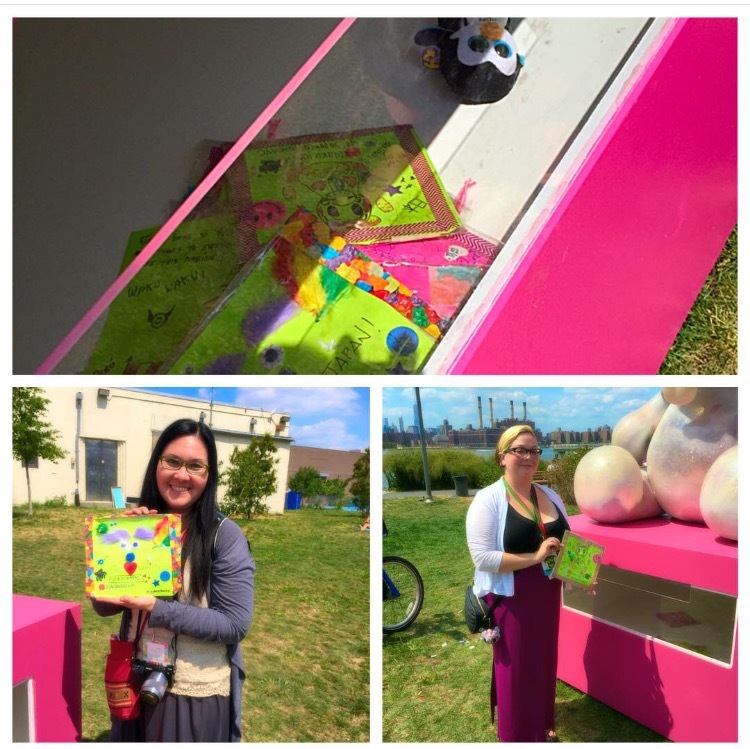 We made our way to Transmitter Park to take part in Sebastian Masuda’s workshop where we hand-made mementos using found/donated materials. 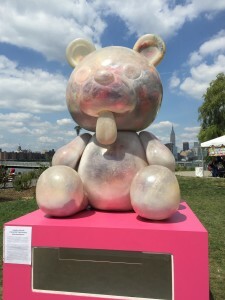 We then placed them inside a bin under Masuda’s Miami Bear, which was temporarily installed in the park for the convention. 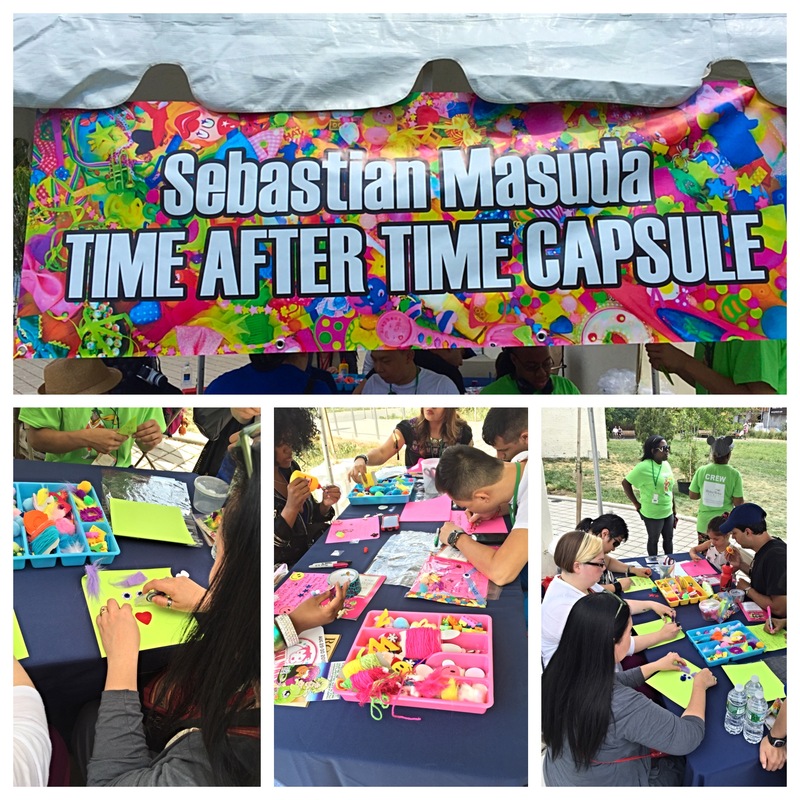 The following day, on August 30, Sebastian took a busload of fans along with all of the mementos created during Waku Waku +NYC to add to the Hello Kitty Time After Time Capsule currently sitting at Dag Hammarskjold Plaza at 47th Street and 2nd Avenue until September 13, 2015. 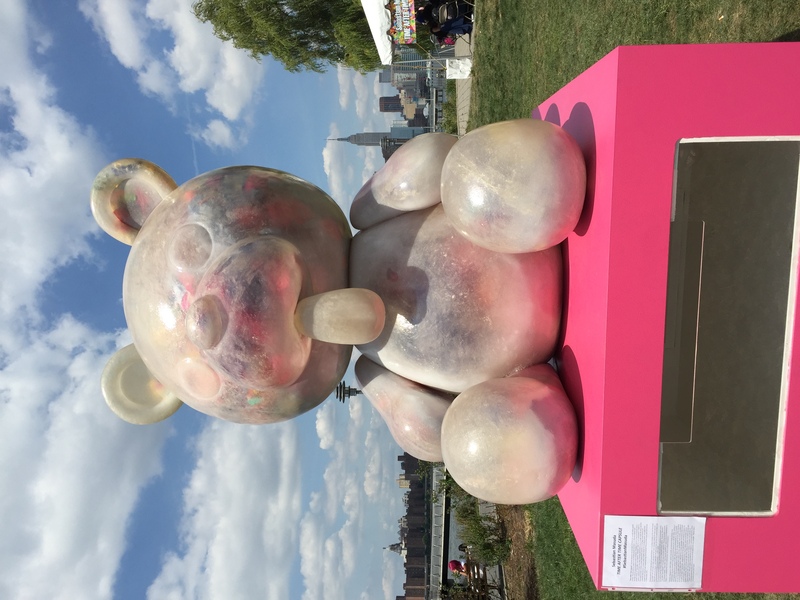 This sculpture, as well as everything inside it, will be reunited with Masuda’s sculptures from Miami and Amsterdam in 2020 in Tokyo for the summer Olympics. Any fan of anime/manga would have loved to sit in on this panel at the Wythe Hotel. 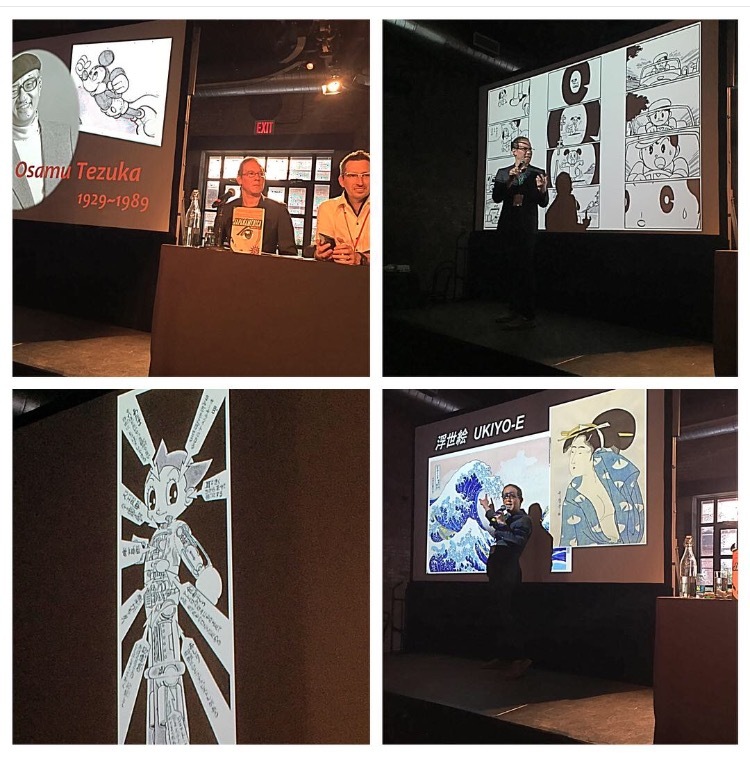 Author of Japanamerica, Roland Kelts led an insightful panel discussing the the man who has been coined as the Godfather of anime/manga, the great Osamu Tezuka. Tezuka-san, born in 1929, pioneered Japanese anime on television. In 1963, his Astro Boy anime was the first to air on both Japanese and American TV both premiering in the same year. But this panel sought to answer: Why was Tezuka-san so important? Tezuka-san lived through the Showa era, led by Emperor Hirohito, and during this time Japan went through great turmoil. Tezuka-san grew up seeing his country militarized by the Japanese government then occupied by the United States. Art was censored, and artists couldn’t draw or say anything about the war. At an early age, he realized that he could use manga as a means of helping to convince people to care for the world. Being that Tezuka-san and his family grew up during the war, he almost died during a fire-bombing. 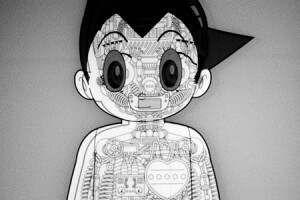 This shock has been said to contribute heavily to the views Tezuka-san expressed in his many works. Another part of his life that was influential in his works was that he grew up and frequented Takarazuka Theatre, which featured an exclusively female cast that portrays men, and so his sense of gender was clouded. As often noticeable in his works, such as Princess Knight for example, the men seem somewhat feminine, with long eyelashes and slender forms, and the main protagonist, a woman, plays as a man. 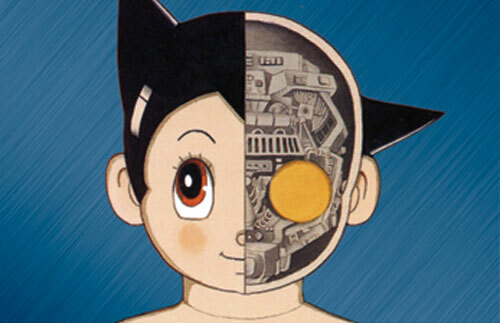 Some say that Tezuka-san was responsibly for the creation of the shounen genre in anime/manga. Emi Kikuchi studied at the Naganuma Shizu Kimono School in Japan, and she is currently a kimono dresser and teaches classes in New York City on kimono dressing. 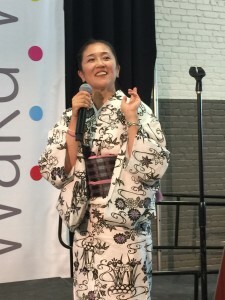 After Kikuchi-san introduces what yukata and kimono are and its significance in Japanese culture, they went into the first segment of the panel, which was how to properly put on a yukata. While popular fashion model/singer Kyary Pamyu Pamyu’s ever popular single “PonPonPon” played in the background, two specialists demonstrated how to put on yukata. Being someone who has put on a yukata on their own a number of times, I think tying the obi correctly is the hardest part! And it is especially hard to get it to look clean and attractive as well. 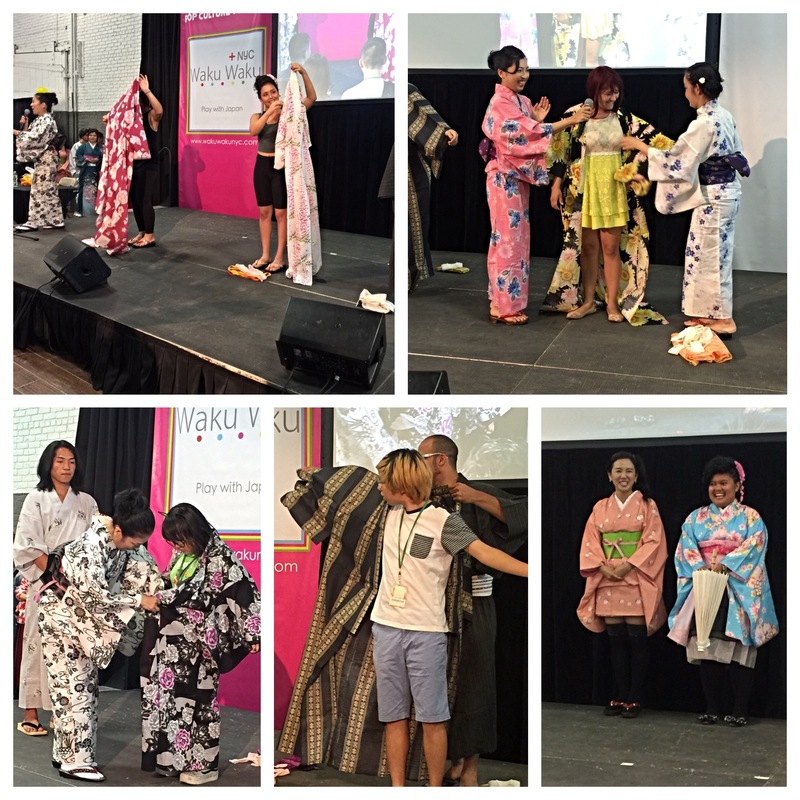 The specialists artfully adorned their yukata and then went on to sing the child favorite “My Neighbor Totoro” theme for the next segment, in which some of Waku Waku +NYC’s con goes volunteered to participate in on and back stage! Three lucky women and one man volunteered to be dressed in their yukata and obi of choice during this panel, and in addition, they also had their hair and make-up done by professional stylists back stage! It was very entertaining to see the volunteers, some who have never worn yukata before, being dressed. They all looked great! As they were getting their full look ready back stage, Kikuchi-san called out others dressed in yukata that were influenced by anime/manga as well as NYC style yukata, which was very interesting! 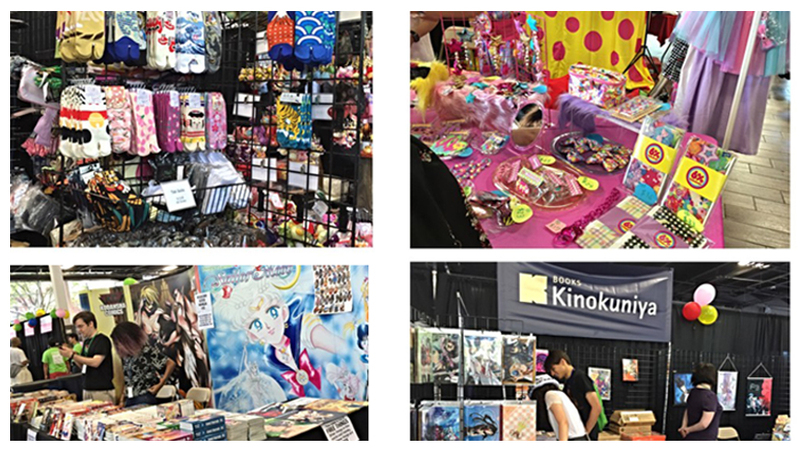 As a whole, Waku Waku +NYC was a great convention to attend and was very successful in introducing many to all that Japan has to offer in its many forms. The expo center was filled wall to wall with pop culture such as anime/manga, which has otherwise diminished from other NYC conventions, such as New York Comic Con, which used to be half New York Anime Fest. A fan of anime/manga myself, it was refreshing to attend this con and hope that it takes root in Brooklyn and grows and thrives for years to come. We cannot WAIT for Waku Waku +NYC 2016! Keep your eye on this space for updated info!